During June 2003 Environmental Research & Design, Inc. (ERD) was selected by the LCWA to evaluate and design perform a feasibility study and engineering design for an off-line alum stormwater treatment system on the Apopka-Beauclair Canal to provide treatment for discharges from Lake Apopka into the Harris Chain-of-Lakes. 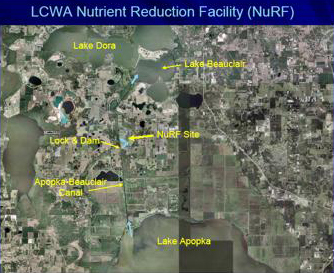 Discharges through the Apopka-Beauclair Canal contribute more than 90% of the phosphorus loadings to Lake Beauclair and comprise the single largest input into the entire Chain-of-Lakes. The collected canal samples were evaluated in a series of laboratory jar tests to determine the optimum alum treatment dose and evaluate settling characteristics. 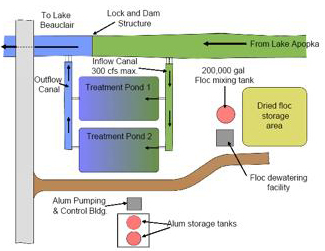 A conceptual design was developed which includes facilities for alum injection, inflow and outflow channels, floc collection in two large dedicated settling ponds, alum storage tanks and containment, floc dewatering using a large centrifuge, a storage area for dried floc, and ancillary facilities. The system also includes two dedicated hydraulic dredges which provide automated floc removal. The design uses the natural hydraulic gradient created by an existing lock and dam structure located adjacent to the site to divert water into the treatment area which avoids the need for pumps to bring water into the system. The unit removal costs for phosphorus are substantially lower than can be achieved with conventional treatment systems. ERD prepared and submitted a FDEP permit application for the project and prepared construction drawings, technical specifications, contract documents, and opinions of probable construction costs at 60%, 90%, and 100% completion milestones. The designed system is the largest alum treatment system in existence and the first to use a centrifuge to dewater alum floc. The treatment system is capable of providing alum treatment for inflows up to 300 cfs which is sufficient to treat more than 85% of the annual discharges through the Apopka-Beauclair Canal. Anticipated alum use is 1.5-3 million gallons per year with a peak use of 38,000 gal/day at the design flow rate. ERD provided construction administration and oversight and assisted the Owner in evaluating change order requests. Construction cost for the treatment system was 7.2 million dollars.